BMW Group has announced the provision of 1,000 new permanent BMW contracts across its four UK manufacturing plants. plant at Hams Hall, near Birmingham, and Rolls-Royce Motor Cars plant in Goodwood, West Sussex are all set to benefit with the recruitment taking place in two phases between 2014 and 2016. Current eligible agency associates will be given priority subject to the normal selection criteria. 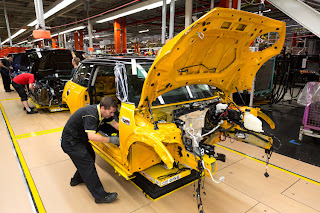 As a major UK employer, investor and exporter, this announcement underlines BMW Group's further commitment to the UK as a strategically important production and sales location for the company. It comes as a result of a major £760 m investment programme from 2012-2015 to support the launch of the new Mini, a new generation of three-cylinder engines and the expansion of our business at Rolls-Royce Motor Cars. The initial recruitment phase covers 700 jobs and will start in the New Year with the recruitment process for the remaining 300 contracts starting in 2016. BMW Group's latest investment programme brings the company's total investment in the UK to around £2-billion since 2001 and has seen a new body shop built and equipped with 1,000 new robots at its Oxford Mini plant, the debut of various new pressings technologies at the Swindon plant and the Hams Hall engine plant being equipped for a new generation of modular three-cylinder engines.